Journey to Ancient Egypt where there’s a Pharaoh with untold riches just waiting for you to come and pinch them! If you’re feeling brave enough Pragmatic Play have developed this new online slots game just so you can get your hands on the Pharaoh’s bounty. It’s a classy game with great graphics that’s an easy play for the experienced and the not newcomers to slots. 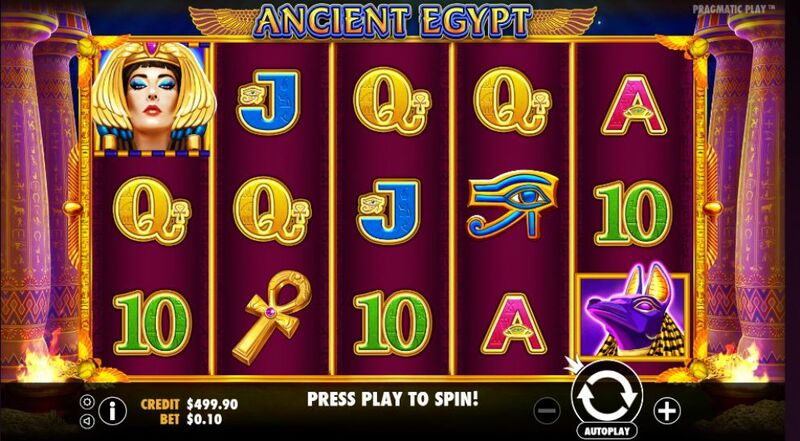 Get the free spins rolling and this could be one lucrative trip to Ancient Egypt Slots games. Formed in 2015, developer Pragmatic Play produces online casino games from their base in Malta. Primarily they develop 5 reels slots and players of all experiences and taste love them, so it’s no surprise online casinos across the globe host them. Pragmatic Play are inspired by a huge range of themes, some already capitalised on by other developers, but this team through entertaining bonuses, features and extras do put their own unique spin on things. Get the best out of our casino slot promotions before you play the game! 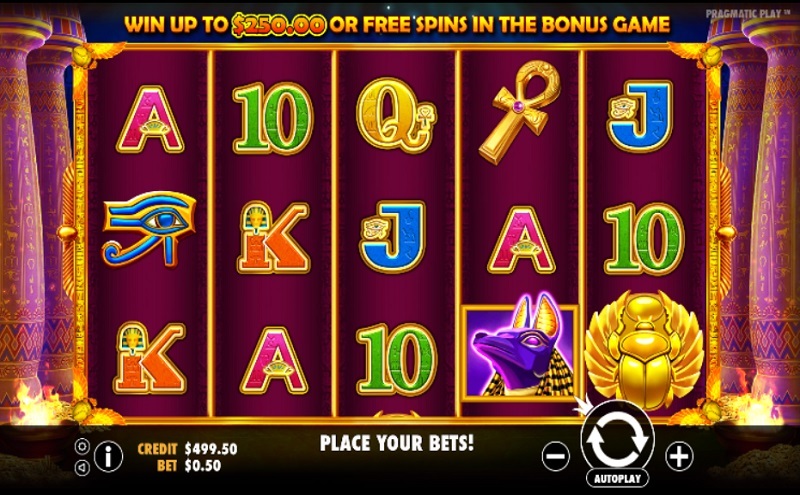 This 5 reel, 10 payline slot from Pragmatic Play is all about attempting to get your hands on the riches of the ancient Pharaohs. It’s a great looking game, has some neat features and you can get started with a stake of anything between 10p and £50 a spin. Everything has a nice luxurious, decadent feel to it and this follows through to the symbols you’ll be playing with on the reels, reels that are pretty ornate within themselves. As with many slots you’ll be looking to line up 3 or more symbols in a row to start landing some prizes. There are the usual playing card symbols that will land you a modest reward but you’ll be aiming to land some of the Egyptian themed icons to really rack up some wins. These include the Anubis the Jackal God, the Eye of Ra and Queen Cleopatra. The mighty queen is the most valuable, she can bring 500x your stake if you find 5 of her on your reels. Once the golden scarab beetle starts crawling onto your reels you’re onto a good thing. This little symbol acts as the wild and the scatter, which is a pretty unusual situation. Bag 3, 4 or 5 of the beetles anywhere on the reels and you’ll get 1x, 10x or 50x your stake and you’ll also activate the bonus game. The bonus game will get you either the low award – equal to your stake, the high award, between 10x and 500x your stake or the free spins feature which will get you 10x free spins.